We’ll be releasing the new iOS app – iOS News Modules – September 1, and it’s a total remake of the existing iOS app. iOS News Modules offers you several clear advantages when presenting your editorial content. Bridging the gap between platforms is a constant priority. We’ve previously redesigned our Android apps per Google’s Material Design guidelines. This enabled us to create the first prototypes of Visiolink Mobile Edition. However, iOS, Android and web, each have specific design languages and advantages – and these differences make it impossible to release completely similar apps for the different platforms. Furthermore, the mobile platform accounts for the largest traffic increase in ePaper traffic across Europe. In other words; it’s time to redesign our iOS apps. 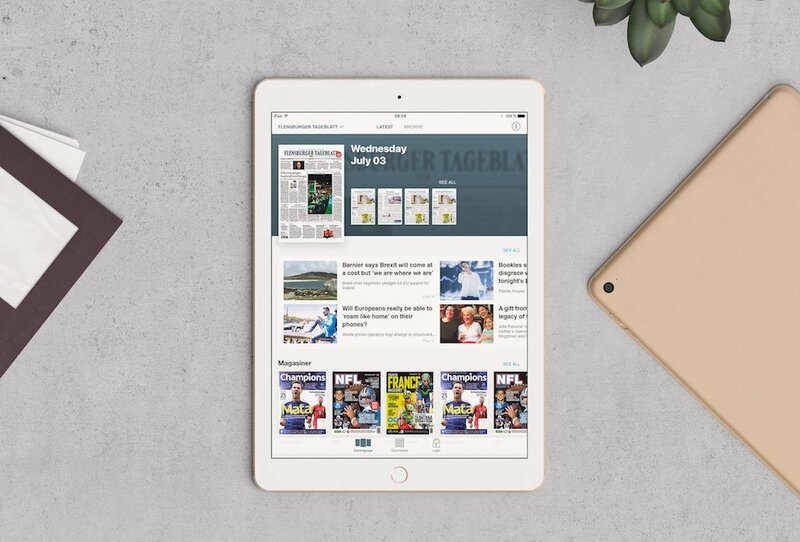 iOS News Modules not only provides editorial flexibility, it's also a platform that's ready to handle the future of ePaper publishing. Here is an overview of the three most groundbreaking features in the upcoming iOS release. Supplying more than 350 iOS apps for newspapers and magazines all over Europe has taught us that no two customers have the same needs when publishing their content digitally. Varying from the smallest local newspapers to some of the largest media companies in Europe, the app framework must be truly flexible to embrace all needs in that wide span. So we built a modular framework. On the home screen, each content type has its own module; Article Teasers, Magazines, Supplements, Live News, Video, Web Views for online content or ads, Sections and Archive Issues. These modules can be placed in any order most relevant for your content. 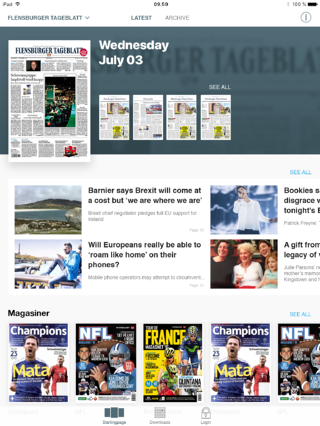 As a default, we place a module containing the latest issue of the main paper or magazine including section covers in the top left of the screen, catching the eye when entering the app. The home screen is scrollable, and this new feature makes it possible to display far more content than today. Additional tabs containing a new set of modules can be inserted, adding even more flexibility to the framework. This is relevant if you want to merge two or more equally important titles into the same app. Swiping away from the home screen accesses the archive, containing all your back issues. Whether you believe in attracting and maintaining subscribers by offering a well-functioning flawless app with great usability, by displaying ads including magazines and supplements to your app design, by driving traffic from the app to your website – or a combination of it all – iOS News Modules provides you with the right platform. Building upon the known Visiolink quality, iOS News Modules emphasizes our first and most important priority; keeping the readers happy. Happy readers ensure greater loyalty towards your content, and the user experience is an essential part of creating frictionless reading. Banner ads in your ePaper app can be a valuable addition to online ad sales. In iOS News Modules, there’s plenty of space to display ads. The feature is controlled with simple online banner tags served from your usual ad system. Magazines, supplements and commercial catalogs are quite important to many publishers. We have built modules that display your supplements in the right context, making sure they get the right amount of attention. Displaying online articles in an RSS feed is not only a way to keep your readers up to date with the latest news, it can also convert them from the app to your website, where clicks and ad impressions count. With a modern UI and a flexible framework, the new iOS app is prepared for both short- and long-term scenarios. These could be hybrid content apps, paperless editions or personalized content. 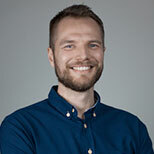 The flexibility of the app framework ensures that even within a standardized setup, we can shape the app in very different ways – even ones that do not include the ePaper. Analyzing our customer’s recent projects, both within their own development departments and along with us, we see a desire to combine the traditional newspaper with new content distribution methods. Whether it’s done by publishing digital only editions or presenting newspaper articles in new contexts, it points towards new directions for the ePaper. We are ready to support this journey now and moving forward. Please note that if you're an existing customer, your current solution won't be automatically upgraded to iOS News Modules. You'll be able to book the upgrade from September 1. Do you have any questions prior to that, do not hesitate to get in touch with your Visiolink contact or simply contact our Support Service: support@visiolink.com.